Ever bought a car with a tampered odometer? Despite the existence of Carfax, Autocheck and the like, odometer fraud still happens all the time. But, they have laws for that – if you catch it in time. Here is what you need to know. In the analog days, odometers only showed six digits and contained little dials you could watch spin – from right to left as a car was driven. I owned a car in high school and had the opportunity to watch the odometer roll over from 99,999 to all zeroes one night on Woodward Avenue. Crafty ne'er-do-wells were tempted to open up those instrument clusters and reset the figures to lower numbers. An afternoon of tampering might increase the value of the car a few thousand dollars. Over time, car makers added a seventh digit to allow the odometer to register hundreds of thousands of miles. One had to drive 999,999 miles to experience the all-zero rollover. Oh, how times have changed. In recent years, odometers have even been made digital – hey, welcome to the modern world! – but that has not stopped odometer fraud. I cannot possibly go into all of the makes, models, and configurations of odometers here. Suffice it to say that the mileage displayed on the dash of your car can probably be tampered with. 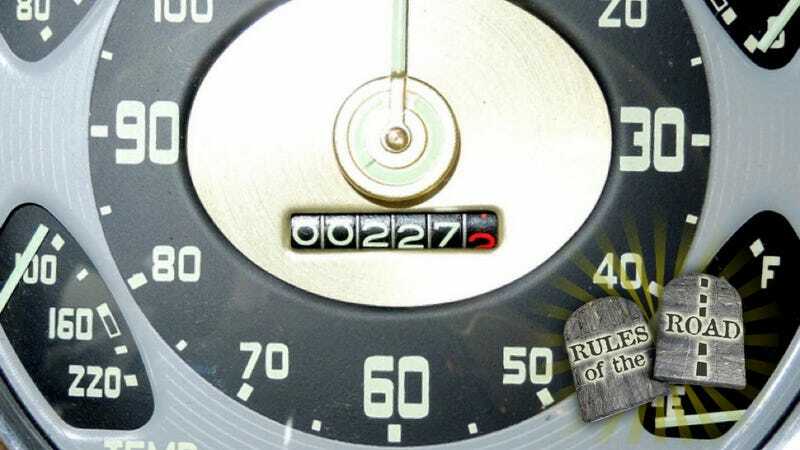 The difficulty of doing it – and the odds of getting caught – vary from car to car but everyone needs to know that odometer statutes protect people who buy cars with spun odometers – even in the digital age. And sometimes, those laws call for the jailing of people involved in this activity. Odometer fraud can be discovered a variety of ways. A Carfax or Autocheck report might note an odometer "discrepancy" – usually because odometer figures were reported to them that were not in sequence. i.e., the numbers did not always increase. And, as Ferris Bueller taught us, numbers on an odometer never go backwards. NEVER. If you don't want to spring for the full Carfax or Autocheck, get the NMVTIS report put out by the government on your vehicle. It's less than $5. It won't have all the info that a Carfax does but it will have all of the odometer reports from each title transfer. Modern cars also have electrical devices called Control Modules which, among other things, track the mileage on a vehicle. This control module is not what controls the number displayed on the dash. So, it is quite possible for someone to tamper with the visible number on the dash while the control module still holds the correct figure. Many of the bad actors who tamper with the displayed mileage do not bother trying to do anything about the stored figure because they do not need to. Checking the stored number is not something the average person does. It requires a tool – something common at a car dealership but not something most consumers have access to. Have a question about the actual mileage on your car? Take it to the dealer and ask them to pull the number from your control module. You'll get a bunch of information that looks something like this. Note the middle line. That number is not merely mirroring the figure from the dash. In this case, the number on the dash read in the 40s. Where did the other 20K go? I suspect the previous owner swapped out the instrument cluster around 20,000 miles. But I digress. There are two avenues of attack if you have an odometer claim. There is a Federal statute and most states have laws against odometer tampering as well. The Federal statute itself has two parts. It makes odometer tampering a felony and it creates a private cause of action. That is, you can sue someone for tampering with an odometer. This is good because the Feds do not pursue criminal actions very often against odometer tamperers. If you sue one successfully, you can recover treble damages or $10,000, whichever is greater, along with your attorney fees and court costs. Many states have odometer laws, too. For example, Michigan's allows the victim to sue for treble damages or $1,500, whichever is greater, along with attorney's fees and court costs. And it too has a criminal prohibition against tampering. Again, it it just rarely enforced. You might wonder why we need state laws when Federal laws appear to have this covered. For one thing, the Federal statute requires a showing of intent. One section says a person may not "disconnect, reset, alter, or have disconnected, reset, or altered, an odometer of a motor vehicle intending to change the mileage registered by the odometer." As you can imagine, the first thing the seller will claim – when they get caught – is that the odometer somehow got disconnected or altered innocently. However, some states – Like Michigan – do the smart thing and remove the requirement of intent. After all, how often does one innocently reset or alter an odometer? MCL 257.233a(6): "A person shall not alter, set back, or disconnect an odometer; cause or allow an odometer to be altered, set back, or disconnected." And because these statutes allow for the recovery of attorney fees and court costs, there are attorneys out there who will take them on contingency. This happened to you? Call an attorney forthwith. State laws vary but the Federal statute requires you to bring your action within two years of it accruing. Every attorney I know who handles lemon law claims also handles these. Something about cars creates the commonality for us. Steve Lehto has been practicing law for 23 years, almost exclusively in consumer protection and Michigan lemon law. He wrote The Lemon Law Bible and Chrysler's Turbine Car: The Rise and Fall of Detroit's Coolest Creation. Hear his podcast Lehto's Law on iTunes here. Top photo courtesy of Mark Lieberman.